The secret ingredient here is just like in my secret ingredient chocolate chip cookies…..CREAM CHEESE! There are many recipes like this floating around on Pinterest. Each one changes an ingredient or 2, so I took a chance and made my own version of this popular crockpot dish. I admit, I was skeptical at first! The sauce seemed to almost look broken as it cooked. 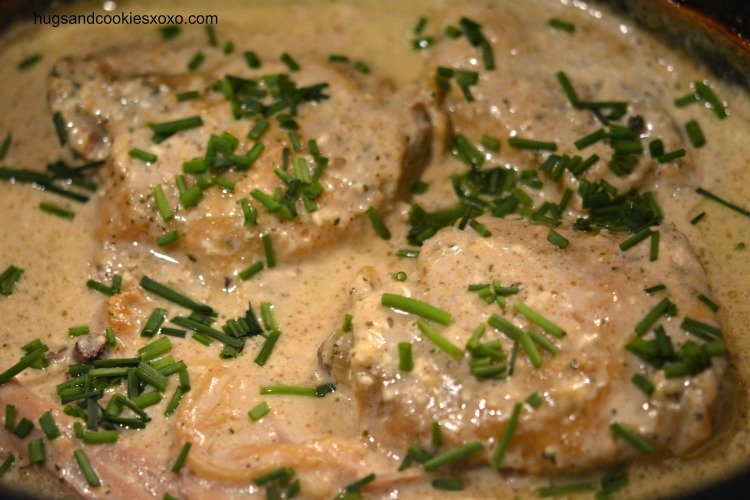 BUT, hang in there because at the end, after a stir, this was the most amazing and creamy chicken! This is definitely a WOW dinner. I shredded the chicken off the bone at the end and poured the sauce over it. This chicken was so good served with rice in taco shells!!! I hope your family loves this one as much as mine did! Add chicken and brown both sides in oil. Remove chicken to plate and drain excess oil. Stir in the ranch dressing mix powder. 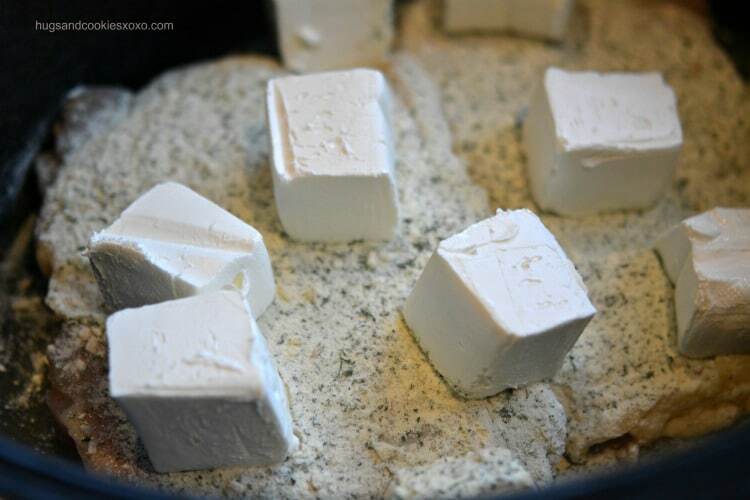 Top with cubes of cream cheese. Cook on high 4 hours. I stirred mine every hour or so to help the sauce along and combine the cream cheese into the sauce. Don;t be worried if sauce looks funky, it will come together in the end! Remove from sauce and shred chicken, discarding skin/bones. Pour sauce over chicken and top with chives ad bacon crumbles. *NOTE: I just made an updated version of this! I poured 1 cup broth on the bottom of crockpot. Laid 3 pounds boneless, skinless chicken breasts on top. Sprinkled the ranch dressing on top and added the cubed cream cheese. Cooked on low 8 hours, used 2 forks to shred the chicken and stirred the sauce. Topped with bacon and it was amazing! Such a shame, all your recipes are looking great, but can’t print them or e-mail them. So frustrating, I will have to close your website. 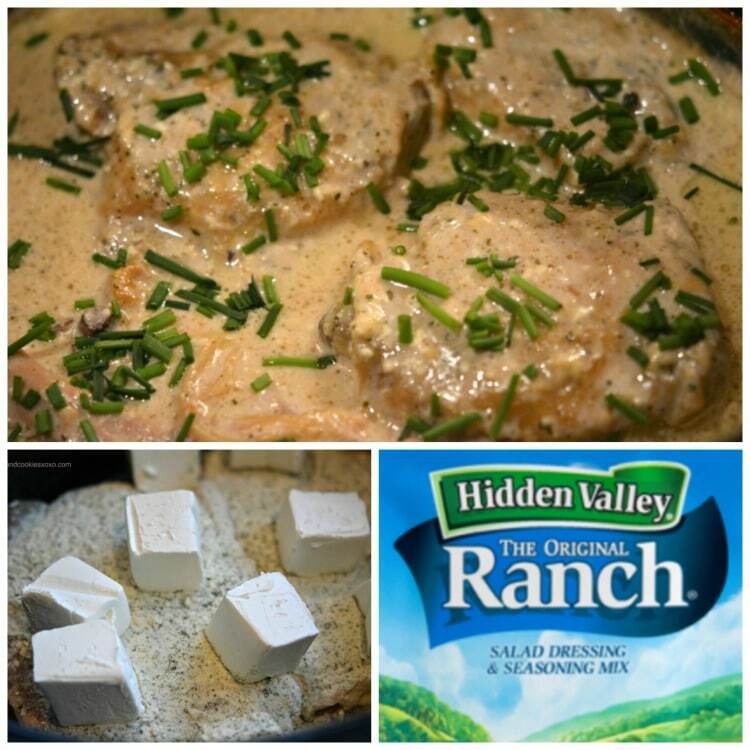 Right beside the words [Secret Ingredient Creamy Ranch Slow Cooker Chicken] in the upper right hand corner is a print button. Ahahahah! You can always just screenshot the recipe. Or pin it on Pinterest. It’s not 2003 anymore, you don’t need to print or email things. Or get angry about stupid stuff and boycott websites over it. Could I use boneless chicken breasts? Would I need to adjust cook time? Hi Pam! I just made this last night with 1 pound of boneless, skinless chicken breasts since that’s all I had in my freezer. I lessen the time to two hours and I added a half stick of butter to make up for the lack of skin. I served it over smashed cauliflower. It’s delicious! I did forget the bacon, though, so next time I’ll remember that!! Did you keep all the other ingredient amounts the same as in the original recipe since you used less chicken? I plan on putting it in at noon today and will try the butter as well since I’m using chicken tender strips. Can’t Wait ! I made this yesterday and it is amazing, so creamy and delicious. I made a bit of corn starch / water to thicken it up and served it over mashed cauliflower. I never comment on the many recipes I try but to not comment on this would be just wrong. Thanks for the great recipe. Thank you so much for taking the time to comment. I loved reading this!!!!!!! Can you use boneless chicken breasts? I am sure you could-u would just want to maybe shorten the cooking time. My pleasure and thanks for taking the time to read my blog!! Do you use fresh or frozen chicken? I have used frozen chicken breasts as I was in a pinch. Maybe I should plan better! They took about 3 hours. Great recipe! I added a few spoonfuls of flour in the end to thicken the sauce a little more. It was still a little separated after the 4 hours so the flour brought it together. Also, I used boneless chicken breasts! So tender!! Had to comment. yummy! Thanks for the recipe! My sauce didn’t come together quite as I would have liked. How much flour did you put in? I would like to try it? Do you have the nutritional facts for this recipe? I have to watch the sodium for my husband. Just read the label on the Ranch dressing,add the sodium to that in the bacon and broth and you’ll see it is quite high for 4 servings so cut back to half a packet and leave out the bacon, and use low sodium broth, how I plan to make it. I made this last night and put it over rice….there are NO leftovers!!! It was soooo simple and INCREDIBLY delicious!!! It will definitely be in my rotation!! I cant wait to explore your website and find even more amazing recipes!!!! That is awesome!!! woo hoo!!! Made this for dinner and boy was it good! I had chicken breast on hand so I used them. And I added a bit more chicken broth to create a bit more sauce. SO good and easy! So glad you liked it!! Yay! This looks great but Im going to make with 1 and a half lbs of chicken breast and I was wondering i can cook on low for longer? In my experience low works better. Any thoughts? Should I just cook it on high for 2 or 3 hours? U could try it on low-just add a few hours and make sure it cooked all the way through. Ok sounds good. Thank you! 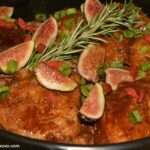 Is there any reason the recipe uses bone in, skin on thighs, only to then discard them later, as opposed to just using the boneless skinless thighs? Does it give extra flavor to the recipe or something? This looks so delicious and I am looking forward to trying it. I was wondering if it could be cooked on low instead of high in the crock pot and if so, how many hours do you think it might take? Thanks so much for your help. Don’t you just double the cook time! Example: 4 hours on high=8 hours on low. I’ve been using crockpots since the 1970s, especially as a working mom. I believe I am on #4. The best invention ever. I made this for tonight! First time I’m trying one of your recipes, I can’t wait! maybe just the seasoning in the ranch? How do I keep the cream cheese from getting lumpy? Should I just add the cream cheese cubes at the end? Or how did you do it?Thank you! I often use my immersion blender on a sauce if it’s not as smooth as I want it be…works beautifully! 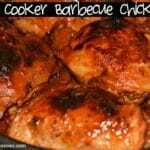 Can I use boneless skinless chicken thighs? yes but adjust the cooking time. If I use boneless/skinless thighs ..and want to cook it on low….How many hours? Do I need to add butter? Not sure as I have only made it with bone in. I’m looking for a recipe that I can put in the crock pot and go to work for 6 hours. I really want to try this one though! Do you think if I put it on low for 6 it would be alright? Can you do this in a Dutch oven? If so. What temp. and how long? I’m thinking 325 for 5 hours? Can you use frozen thighs? I made this tonight with boneless skinless chicken breast in the oven a dutch oven 200 temp 2.5 hours and it was really good. I wish the sauce was a bit thicker so will be looking for a low carb thickener for next time! My son like this recipe. He was the only one in my family that did. I think with a few tweaks it could be a good dish, but it will never be amazing. If i use boneless skinless breast how long should I cook it for in the crock pot and what temp? It completely curlted. Didnt do what it was suppose too. Had to throw it away. Oh no! The post mentions the sauce may seem broken but in the end once stirred it should all come together. I love using the crockpot! 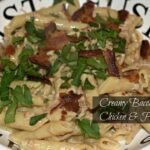 The kids loved this recipe and I have to admit i cooked a whole bunch of bacon to have ready for this recipe and I had it on the counter to cool and stepped away and the dog ate whole pound of bacon ! So I had to run to the store and cook more bacon ugh ! But it was totally worth it to have bacon on it ! I never usually comment but I had to on this one! I LOVED this recipe. I’m trying to clean out my freezer/pantry and had everything except the cream cheese so I made it with the sour cream I had on hand and it turned out great as well. I also cooked a side of spaetzle (German noodles) on the side and it worked very well with it. Definitely want to try it with the cream cheese next time! The sauce was very thin. Looked now thing like the picture. Hate to add flour because I don’t want he carbs. What are the nutrition facts? Do you know for this recipe, per serving? I don’t think I want to know! hahaha! This recipe was so so incredibly good! I followed all the instructions but I totally forgot the bacon. 🙄 It was still amazing! I served it to my family over rice. I am currently doing keto so I just served mine in a bowl over steamed broccoli and it reminded me a lot of chicken divan. This is a keeper for sure! Thank you for good, low carb comfort food! We just had it tonight, too!!! I forgot the bacon the first time I made it, too!!! The recipe calls for putting chicken on top of cream cheese, but the picture seems to show the cream cheese on top. Which is correct? I just moved the cream cheese to the top for the photo-so you could see how it is cubed. I am thinking about using 4 lbs chicken tenders (raw). Do I still need to saute before hand? Also, how long to you recommend int he crock pot? Do we have to brown the chicken before? You don’t have to but it is better if you do!! I’m using a creamy ranch dressing in a bag will it still cook the same? In the beginning.. are you sautéing the onion in a skillet and adding the chicken? Or are you using the crockpot to do this? I would think a skillet and then i guess add the onion to the crockpot after this before the chicken broth? Thanks for your help! My crockpot allows you to brown first-if yours doesn’t, use the skillet. As many people do I made a few changes, followed the recipe exactly but added a few things such as fresh green beans and mushrooms at the end of the cooking time for added vegis (gotta get them in for the family so they won’t notice). 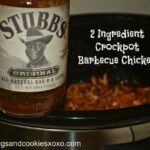 This might just be the best crockpot chicken recipe Ive ever made. My family raved about it amd all the left overs are gone!!! I also stirred mine through out and added some heavy whipping cream for a nice gravy (I noticed someone said they added butter. It came out delicious, creamy, and full of flavor. I also served mine with riced cauliflower and it couldn’t have been a more perfect meal. Another add was when I browned my chicken I dusted with flower and spices. Thank you so much for this wonderful recipe. It is now in the “family approved” rotation. And the bacon and sauteed onion made the entire dish…try not to forget that if you can!! Happy cooking!! Could you do this recipe in an instantpot? I am not sure as I don’t own one.